FAIRFIELD, N.J. – October 10, 2018 – Crispy Green®, the maker of Crispy Fruit premium freeze-dried fruit snacks, will be exhibiting at the annual FNCE Show at the Walter E Washington Convention Center, Washington, DC on Oct. 21st -23rd at booth #1340. 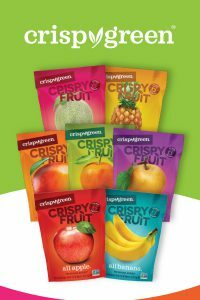 You’re invited to stop by, meet the team, see the beautiful new Crispy Fruit packaging and taste for yourself why Crispy Green remains the #1 freeze-dried fruit brand in the U.S.! The Crispy Green brand has been a major contributor to the growth of the healthy snack category. Exhibiting at the FNCE show is one more way the brand demonstrates its commitment to providing clean ingredient, convenient snack options to a world obsessed with snacking! Join the Crispy Green Facebook Live Experience! While at the show, Crispy Green will be sharing the FNCE vibe with all their Facebook fans, while providing opportunities to win some great prizes! Stop by the booth to share in the fun. The event begins on Sunday, Oct. 21st at 11:00 a.m. EST.